About 30 elementary age boys and girls and a half-dozen adults – all fiddlers – tucked their instruments under their chins to perform some good old-time string classics of folk and country music July 15 at The Broken Spoke. Little girls, some as young as 5 years old, with braids pulled up on top of their heads and dressed in their best embroidered dresses or ruffle skirts and lacy tops, stood beside little boys wearing plaid shirts and Wrangler jeans. Most all wore cowboy boots. They donned Texas Resistol straw hats in white and red and a few wore western scarves tied around their necks Lonesome Dove style. Meanwhile, parents shot video from the side porches along either side of the bandstand or upon the dance floor, with their digital camcorders, cameras, and smart phones. Beneath the glow of neon signs advertising well-known beer labels, dozens of families came together inside one of Texas’ oldest — if not Austin’s most well known honky tonk. Without drinking a drop of alcohol, adults clapped and raised some revelry for their children. Mothers with infants in their laps and fathers with babies on top of their shoulders turned The Broken Spoke into a romper room of “G”-rated fun. Mary Hattersley and her Blazing Bows Suzuki-style music students performed within just a week from the day that she underwent cancer surgery. “Sweet Mary,” as folks call her, smiled, sang, danced and played fiddle like nobody’s business from a set list that read an awful like a music history lesson. “Fiddle Fest” provided the finale to a Blazing Bows two-week summer camp that has culminated at The Broken Spoke annually for nearly 20 years. However, for the first time in as long as some fans can remember, one of The Broken Spoke’s original owners, James White, did not attend the performance. Instead, White rested at home following surgery July 3. Doctors have placed a Defibrillator inside the left side of White’s chest to regulate irregular heart rhythms. He also broke his foot recently walking on the Town Lake trail. White has worn an orthopedic “boot” or removable cast since mid-June and he has a few weeks to go before his bones heal. Mary Hattersley’s husband, Cleve Hattersley, accompanied the group on guitar, and fiddler Kay Mueller helped lead the fiddle performance along with another fiddler, Catherine Van Zanten. Together the four Suzuki teachers have represented “Fiddle Fest” since around 1994. The Hattersleys along with Mueller and Van Zanten also bring their students together at the Austin Suzuki Academy on Saturday mornings for group and theory lessons. Blazing Bows’ former campers have returned every year to perform their finale at The Broken Spoke as part of the Hattersley family tradition. “It gives me so much joy to play music. You can get all bollixed up in music with the practicing and the playing, but it’s all about the joy,” Mary Hattersley said. The Blazing Bows perform at the Old Settler’s Bluegrass Festival in Dripping Springs each April and at the Austin Art Festival in July and previously performed at the Pioneer Farm May Pole celebration. They cancelled all other summer shows when doctors diagnosed Mary Hattersley with vulvar cancer last June. In December every year they perform at the Austin Armadillo Bazaar. They plan to also take their Blazing Bows shows to local celebrations, nursing homes, and schools as well in 2014. 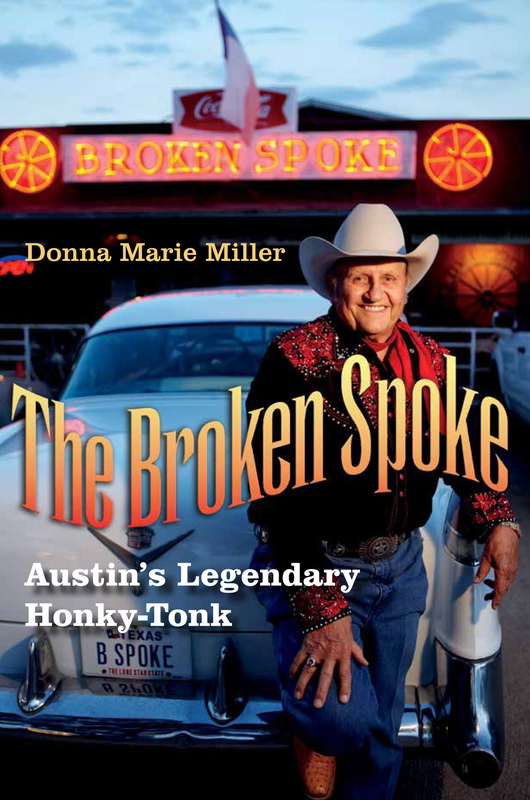 “It’s so important to me and the Blazing Bows to play at The Broken Spoke because of the music history. People remember going to The Broken Spoke when they were kids. A lot of times, it was a family place,” Mary Hattersley said. Ironically, while their Blazing Bows have played The Broken Spoke regularly for nearly two decades, while the band, Greezy Wheels, never performed there. The Hattersleys reunited the band, Greezy Wheels in 2001 and it became the first in town to sign to a major label. The band has since formed its own label, Mahatma Records, and made The Austin Chronicle’s top ten list in 2011 for their album, Gone Greezy. Some might label the past few years as Greezy Wheels “heydays,” but the band’s fan base knew the group’s sound as one ahead of its time – once referred to as “progressive country” 40 years ago. The Greezy Wheels created the sound as an amalgamation of country and western, blues and jazz music. Cleve Hattersley played mostly solo one-night gigs around Austin before forming the Greezy Wheels band in the 1970s. Its members convinced Mary Egan to leave Kenneth Threadgill’s band, the Hootenanny Hoots, and to join the Greezy Wheels. Not long afterwards, Threadgill’s restaurant proprietor Eddie Wilson and co-founders of the old live music venue, Austin Armadillo World Headquarters, caught their show. Wilson jumped at the chance to book the Greezy Wheels as a back up band for the Flying Burritto Brothers and the band’s reputation just took off after that. The Greezy Wheels played the Armadillo World Headquarters more often than any other band and backed up the most national music stars regularly. “We backed up ‘the Boss,’ Bruce Springsteen at Armadillo World Headquarters when he was doing his first tour of the United States. He had just played Houston and a bunch of people followed him down here to Austin. He was young and nobody really knew who he was,” Mary Hattersley said. The Greezy Wheels backed up other regular acts at the Armadillo World Headquarters at the time, including Willie Nelson, Marcia Ball, Alvin Crow, Asleep at the Wheel, and Doug Sahm before the group disbanded in 1978. Twenty-five years later, Mary and Cleve, and his sister, Lissa Hattersley, reunited the Greezy Wheels in 2001. Currently, their newest album, Kitty Cat Jesus, which released in May features two songs: “I Cry Myself to Sleep,” and “I’ll Get Away With It,” that have received lots of local radio station air play. Other Greezy Wheels members include: lead vocalist Lissa Hattersley and other band members: vocalist Penny Jo Pullus, drummer Johnny Bush, bassist Brad Houser, and trombone and harp player, Matt Hubbard. Both Bush and Houser previously played with Edie Brickell and The New Bohemians in the 1980s. Hubbard also performs with Willie Nelson. The Greezy Wheels will perform again Oct. 11 at the Starlight Theater Restaurant and Saloon in Terlingua and Oct. 12 at Padres Bar and Grill in Marfa as part of the Chinati Foundation Open House there. The event includes two days of art, music and lectures and brings in visitors from all around the world. Mary’s dad, Oscar Butler, represents somewhat of a legend in West Texas music circles as he worked as a choir professor at New Mexico State University in Las Cruces, N.M. Butler put a violin under his daughter’s chin when she turned ten. Years later, she attended NMSU, but only from 1961 through 1962, before running off to San Francisco. Mary lived in Santa Fe, NM before she moved to Austin and met Cleve Hattersley. This past June marked the couple’s 39th anniversary, as common law husband and wife, legally registered in Travis County. Cleve is 66 and Mary just celebrated her 70th birthday June 8. Doctors diagnosed her with vulvar cancer and removed all the affected tissue July 2. “They found out I had it right when we were in the middle of (Blazing Bows) summer camp. I decided we would do camp anyway. The doctors went in and found the cancer all in one place and got it out. The surgery went well. There’s nothing else required,” she said. Fiddle history resounds within the Blazing Bows as much as their music. Mary Hattersley introduces each song to their audiences with a brief history. Interestingly, “Bile em Cabbage Down” often translated to “Boil them Cabbage Down,” for Mary Hattersley’s students has been renamed “Violin Cabbage Down.” The fiddle breakdown features seven variations. “One year we were playing this song and the electricity went out (at The Broken Spoke,) and we just kept playing it in the dark. We were still playing when the lights came back on. It was so cool,” Mary said. The first song the group performed, “Lil’ Liza Jane,” enjoys a long history that dates back to the early 1900s with roots in standard, jazz and bluegrass music. First recorded by Bob Wills and the Texas Playboys in 1947, Nina Simone performed it at the Newport Jazz Festival in 1960, then David Bowie and his King Bees performed it in 1964, and The Band recorded a version of it in 1968. Finally, it appeared on an album recorded by Alison Krauss and Union Station, which earned a 1998 Grammy Award. The Blazing Bow’s third song, “Rubber Dolly” made famous by Appalachian string bands in the 1920s and 1930s became a favorite performed by 1960s folk singer Woody Guthrie and then 1970s country singer Ray Price. For their fourth piece, local fiddle player Billie Curtis performed the American classic entitled “Soldier’s Joy,” a 200-year-old song recognized as the oldest and most widely distributed tune in the English speaking language. Curtis, who plays with Lone Star Swing, formerly played with Houston’s popular Wild River Band, as well as Western Swing legends such as Johnny Gimble and Herb Remington. He has a daughter who plays with the Blazing Bows. His band performs at El Mercado in Austin most Thursday nights. The Blazing Bows also performed “Drowsy Maggie,” featuring Anna Wicker on the fiddle, followed by a medley of “Turkey in the Straw”/”Arkansas Traveler”/”Devil’s Dream,” – a fiddler’s all-time greatest hits list. Performing “The Orange Blossom Special” with the Blazing Bows holds particular significance to Mary Hattersley. She remembers once teaching fiddler Jean Luc Ponty to play the song backstage at the Armadillo World Headquarters while they waited to perform back up to Frank Zappa and his band, The Mother’s of Invention. She and the children also performed “La Culebra,” translated “The Rattlesnake,” a mariachi standard. Its origins reach back as far as 1944 when Ruben Fuentes Gasson played it with Mariachi Vargas de Tecalitlan as the group’s violinist and composer. Later his reputation grew when he performed on Linda Ronstadt’s multi-Platinum album, Canciones De Mi Padre. The Blazing Bows performed Cotton Collins’ version of “Westphalia Waltz,” about Polish immigrants during the Great Depression who worked in the coalmines of the Alleghenies and in the mills of Massachusetts. Collins and his Lone Star Playboys renamed the folk song after the Texas town by the same name and performed it often as part of their lunchtime broadcast on radio station, WACO in Waco. And the Blazing Bows rendered Glen Miller’s big band song, “In the Mood” a fiddle version at The Broken Spoke. The song once considered “racy” and originally written about Tin Pan Alley later became part of The Beatles’ recording of “All You Need is Love,” thanks to producer George Martin. The Blazing Bows performed one of 129 versions of the often misspelled Irish folk song about a bar maid, “Drowsy Maggie,” as well. The song became internationally known after the band Jethro Tull first performed the song in concert in 1989 at the Apollo Theater in Manchester, England. The favorite of the night, “The Cotton-Eye Joe” had family members dancing on the dance floor in front of The Broken Spoke bandstand. The Moody Brothers’ version of the song won a Grammy Award nomination for best country instrumental in 1985. Then The Chieftains received a Grammy Award nomination for their album, Another Country, with Ricky Skaggs in 1992. The group closed the night with “Ashokan Farewell,’’ named after a camp in the Catskill Mountains not far from Woodstock, New York, once run by Jay Unger and Molly Mason. Written originally as an instrumental Scottish lament, called “Fiddle Fever” Ashokan campers later wrote lyrics. Two 16-year old girl members of the Blazing Bows, offered their own words to the song July 15. The song once served as the opening track to a PBS special about the Civil War, created by filmmaker Ken Burns. Twenty-five other versions of the song played in the 11-hour series produced and broadcast on television in 1984. The song’s poignant lyrics focus on the emotions young musicians feel about leaving fiddle camp. It served as an appropriate closing performance for the Blazing Bows’ program finale at The Broken Spoke.